PTM Corp. provides 600 part numbers —stamped and fourslide parts—for some 70 customers, in addition to operating a sheetmetal-fabrication shop. It specializes in fasteners, clips, brackets and similar parts, as well as small assemblies. brighter today, as the firm, primarily an automotive supplier, has been able to call most of its employees back to work. Additionally, it’s hired two new sales people to help it develop its customer base in the military and government sectors, and added a third specialist to focus on the automotive market when a competitive stamper recently closed its doors. 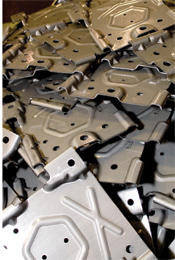 PTM serves as a Tier One supplier to automotive OEMs by providing a patented clip used on the assembly lines of OEMs; it also supplies stamped and fourslide parts that stay with the vehicles. Since its inception, the family-owned business has offered 300-ton capacity to the marketplace, enough to grab a decent amount of market share but often not enough capacity to grab entire programs. It specializes in fasteners, clips, brackets and similar parts, as well as small assemblies. For that reason, earlier this year the 37-yr.-old company leaped at the opportunity to acquire on the used market a 1996-vintage 600-ton mechanical press manufactured by Eagle Press & Equipment Co., Oldcastle, Ontario, Canada. Along with the press, rated to 60 strokes/min., came an Allen Bradley Panel Vision control, a 48-in. feed line from Dallas Industries, and a 20,000-lb.-capacity straightener and uncoiler from Mecon Industries. Press bed size is 144 by 54 in. PTM acquired the press as-built with a transfer system on board. It immediately sold off the transfer system—for half the price it paid for the press. Instead, it will use its own proprietary transfer system, designed and built inhouse, for any high-tonnage transfer jobs that come down the pike. The system attaches to the die rather than the press, and can either stay with the die or be removed and installed on other dies. About half of the firm’s book of business—for about 70 customers and 600 part numbers—comes from its press department, 40 percent from four-slide operations, and 10 percent from sheetmetal fabrication and secondary assembly including welding and riveting. For more than half of its production jobs the firm has some level of design or redesign input, and that percentage continues to grow. PTM’s new Eagle press hits the ground running in December, stamping a high-tonnage job for an automotive OEM. The part—a large bracket—is of an advanced high-strength DP590 dual-phase steel that PTM expects to occupy the press for about 12 hours per month and account for $600,000 in annual sales. Not a bad start for a new press line. PTM, like most successful stampers these days, also is busy upgrading other areas of its operations, including investing in its ERP system to include a module called Global Financials (for its Infor ERP Visual software). The firm also runs a tool design and build house called Modified Technology. It added the Global Financials module to help consolidate and control the financial accounting information for both companies. “This is an important tool for us in managing our growth and plans for the future,” says Russell, noting that the firm plans to move all of its prototype-development work out of PTM and into Modified Technology, to create an advanced engineering center.